Apple this week updated its iPhone User Guide for the upcoming release of iOS 12.1, confirming the latest version of the mobile operating system will include Group FaceTime and, for iPhone XS and XR, dual-SIM support. Group FaceTime in iOS 12. Available for free through Apple Books, the revised "iPhone User Guide for iOS 12.1" is largely unchanged from a previous version created for iOS 12. There are, however, two major additions that confirm upcoming availability of features teased at WWDC 2018 in June and Apple's iPhone unveiling last month. The e-book, which serves as a digital manual for new iPhone users, now lists Group FaceTime as a iOS 12.1 feature. 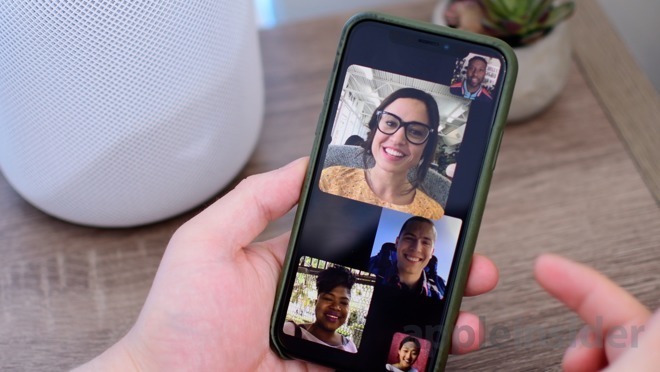 Introduced at WWDC, Group FaceTime allows users to conduct FaceTime video conference calls with up to 32 participants. Originally slated for release with iOS 12 in September, Apple postponed launch in August. The feature returned for testing in the first iOS 12.1 beta issued to developers last month, prompting speculation of its inclusion in a final build this fall. In addition to Group FaceTime, the user guide also notes dual-SIM functionality for iPhone XR, XS and XS Max will go live when the iOS point update sees release. A tentpole feature of Apple's latest smartphones, dual-SIM support allows iPhone owners to utilize two cellular plans on a single device without constant SIM card swapping. Apple's solution relies on Dual SIM Dual Standby technology, which keeps both a physical SIM and an embedded eSIM — or a second physical SIM card in China — addressable simultaneously. Apple has not specified a release date for iOS 12.1, though beta versions have been in testing since mid-September. The update could coincide with a media event next week, where the company is expected to unveil new iPad Pro and Mac hardware. Apple's iPhone User Guide for iOS 12.1 is a free download from iTunes. AppleInsider will be at Oct. 30's "There's more in the making" event. Keep up with our coverage by downloading the AppleInsider app for iOS, and follow us on YouTube, Twitter @appleinsider and Facebook for live, late-breaking coverage. You can also check out our official Instagram account for exclusive photos.